Bilbao is a seaport in the north of Spain. 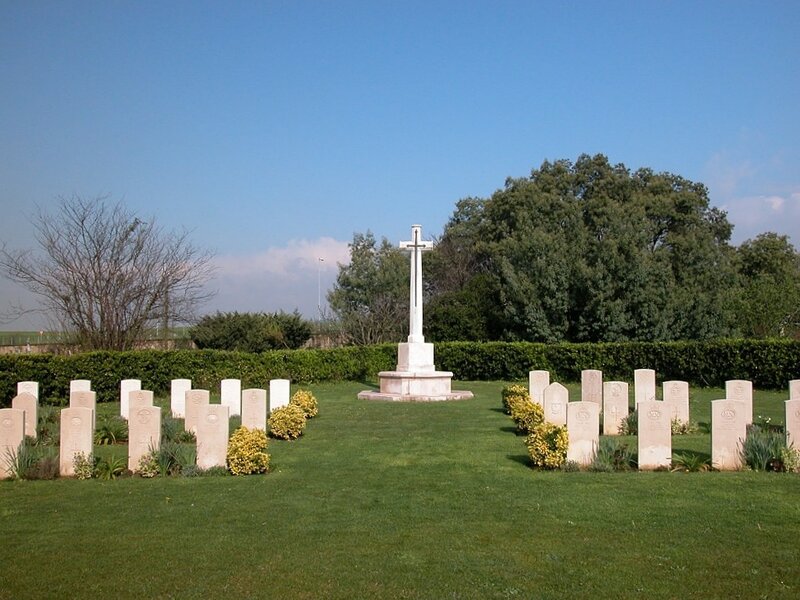 The British Cemetery is about 8 kilometres north-east of the town, on the road to Derio. If arriving by air, turn left on leaving the airport and continue for a short distance to Sondika village. On leaving Sondika village the cemetery, located within a small communal cemetery (there is a tiny church), will be found approximately 100 metres off the main road. 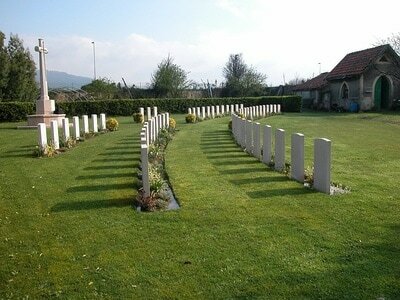 The British Cemetery at Bilbao, contains a plot of 56 Commonwealth war graves and 2 Polish airmen. Of these, 48 are Commonwealth casualties of the 1939-1945 War. The majority of these men were originally buried in the following scattered cemeteries on the northern and western coasts of Spain, chiefly in Galicia, where permanent maintenance of the graves could not be assured:- Burela Cemetery; Carino Cemetery; Caeres Cemetery; Cedeira cemetery; Corme Cemetery; Corunna cemetery; El Grove Arosa Bay Cemetery; Jornes Churchyard; Marin Cemetery; Puerto de Barquero Cemetery; Randin (St. Juan) Churchyard; Ribadeo Cemetery; Lugo; and Vigo Civil Cemetery. The plot also contains four 1914-1918 War casualties and 3 special memorials, which commemorated men who were buried during that war in Carino (San Bartolome) Cemetery, Santa Pola Roman Catholic Cemetery and Valencia Provincial Roman Catholic Cemetery, but whose graves are now lost. An additional 1914-18 war grave (a merchant seaman who was initially buried in the Town Cemetery at Ondarroa, on the coast of the same Province, and then in the old British Protestant Cemetery) can be found amongst the civilians graves in Plot G.